My LMP was 3/24/12 and today I should be about 8 weeks and the u/s showed two very clear sacs, but NO heartbeats??? Could it be possible it's too early or SHOULD there be a heart beat by NOW? I was wondering if someone could help me out here. 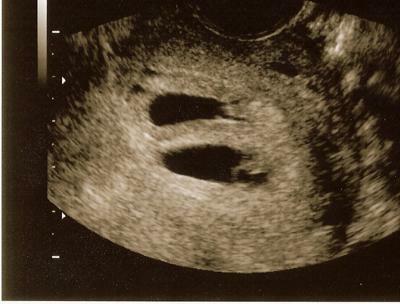 My ultrasound picture looked exactly like this one, with 2 sacs, at 6 weeks 4 days. The ultrasound tec didn't say anything about there being 2 babies...is it possible that he missed it? or isn't he allowed to tell me? my husband even asked if there were 2 heartbeats but he didn't say anything. i thought that the u/s tec could tell you, but maybe i'm wrong or maybe he missed it? it's driving me crazy!!! I Just found out last week that we were expecting twins via ultrasound!!! we were so excited, a little nervous because our 2 yr. old son was born at 33 weeks. We had a formal ultrasound for dates and one baby was measuring 7weeks 1 day and the other baby was measuring 6 weeks and 4 days. I just don't know if that is normal to be measuring differently. They both had great heart beats at 160 and 154. I think we are just a little anxious!! I guess now its just a waiting game for the next ultrasound. To be honest...I don't think so. Maybe one got started a little sooner than the other and will catch up soon enough. I will pray that is the case, as I really don't know. hi i just found out that i am carrying twins..im young but when i saw my ultrasound pictures my heart just gave out all these emotions and im happy and feal blessed to be carrying twins..but i am a little scared the heartbeat of one of baby a is 102bpm and baby a is 95 so thats a little low.. i am only about 6 and a half weeks along should i be worried that my second babys heart rate is lower? Well, it has been a bumpy ride the past few weeks, but I am feeling much more accepting, and even more excited about this pregnancy. I have heard that heartbeats can be detected as early as 6wks and up. At this ultrasound, both babies were at 119 BPM according to the tech. Next one is in 3 weeks to check on them. I will be 14 weeks then. Every pregnancy is different, but I want to encourage you all to keep hope. Everything I have and will have is completely riding on hope and faith now. I still have my not so good days, but I appreciate everyone's kind words thus far! Twins at 6 weeks too! I found out I was having twins at 6 weeks as well. The week before this the sonogram tech told me that I have a blood clot and that the pregnancy would not last. She had estimated that I was six weeks along. I was devastated because I had just micarried (I believe to be a set of twins) 6 weeks earlier. We were both quite shocked to find that I was indeed carrying twins and that there was no blood clot at all. When I miscarried the doctor at the emergency room told me that the reason I miscarried was because of a blood clot. This is why I believe that my first pregnancy was indeed twins as well. I believe it's truly a miracle to have been blessed with twins. I hope someone has a similar story with a great outcome. I am six weeks pregnant and I was told two days ago I am carrying twins. We could clearly see two gestational sacs, but could barely see only one yolk. Two days later, today, I had another u/s. There are still two gestational sacs and one clearly visable baby with a strong heartbeat. However, we could not see clearly in the other sac. Is it just too early to see the other baby? The doctor really had to look hard for the first baby and heartbeat, so I am just worried now about the second baby. I have no idea about my hcg levels. I never asked and they never volunteered I guess. Sorry I cannot be of more assistance! Good Luck! Thank you so much for your encouragement! I will definitely keep it in mind. I am so blessed to have come across this site. I just know that it will help me through this. I think every Mom experiences the same shock when she sees TWO babies on the ultrasound screen. I know that you had not planned on anothe baby at all, but don't feel guilty or bad that you are feeling so many emotions that are not positive. While different than your situation, we had "planned" on 2 children and now will have 2 and 3. I remember the range of emotions I went through in the first few weeks and months after we found out, even some grieving. I am 27 weeks now and have had ample time to digest the news and am really looking forward to the excitement and wonderful challenges of 2! Congratulations!!!!!! !